Teams and individual working to improve cancer care in the UK and Ireland were recognised for their good practice and joint working at a major national awards event. Among the winners at the Quality in Care (QiC) Excellence in Oncology programme, held at the Hilton in Liverpool last week, was England's national cancer director Professor Sir Mike Richards, who was honoured for his career-long commitment to tackling cancer with the lifetime achievement award. "It has been a huge privilege being national cancer director for the last 13 years now. It just would not have been possible without all the teams that I work with – NCAT, the NCIN, the DH, NHS Improvement, charities, the pharma industry – all of those groups are vital," Sir Mike said in his acceptance speech. "It has just been great, because we have created between us a movement which has undoubtedly led to huge change. But we know the job's not done, and I'm relying on all of you to keep it going." Elsewhere in the individual categories, Jan Temenos picked up the cancer professional of the year award for her work with the Acorn Approach to raise awareness among children around the issues of death and dying, while Linda Geddes of New Scientist won cancer journalist or blogger of the year for her special report on how the stigma of lung cancer may be impeding patients' access to treatment. Other winners recognised for their efforts to support cancer care included the Significant Clinical Incident Forum (SCIF) of the Velindre Cancer Centre, which won cancer team of the year for its work to foster an open culture towards clinical incidents and disseminate learning from care episodes. Collaboration was key to several award winners too, and It's In The Bag, a project that saw the NHS come together with patient representatives to support men with testicular cancer in south west England, won cancer charity initiative of the year. Also recognised were the achievements of The Robert Ogden Macmillan Centre at St James's University Hospital for its Hair Loss Support Service, which won the award for improving the quality of life for people living with cancer. “Everyone is delighted that the Hair Loss Support Service has been recognised in this way. I am so proud of the Robert Ogden Macmillan Centre Team as a whole, staff and volunteers and it is great to get national recognition for our efforts to enhance the quality of life of cancer patients.” Sadie Smith, Macmillan information and support manager at the Robert Ogden Macmillan Centre. QiC Excellence in Oncology is an evolution of Pfizer's Excellence in Oncology awards, and aims to bring together some of the leading figures in the UK oncology industry, patient support and NHS care. Its goal is to identify good practice in UK cancer care and help ensure that all patients and healthcare professionals benefit from this work through subsequent dissemination efforts. Initiatives were recognised across 11 categories, covering key areas identified in the NHS Outcomes Framework as well as providing indivudal and team awards. Other therapy areas to be covered by the QiC programme include diabetes, which now enters its third year. 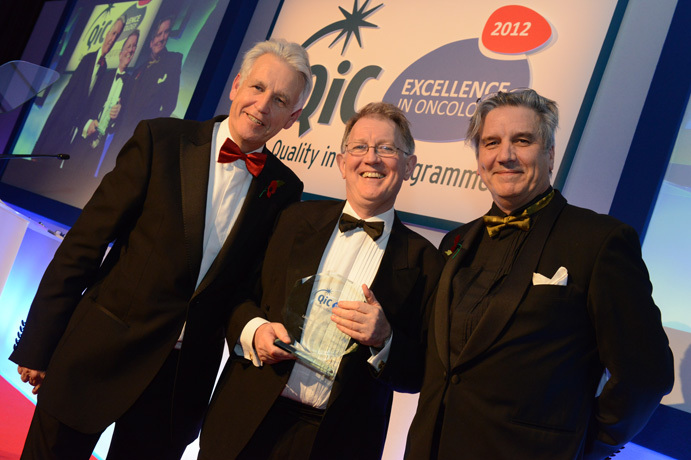 • See a gallery of all the winners from QiC Excellence in Oncology 2012.